Choose a media and run with it, Sally suggested in this week's photo essay prompt. Create Art! I already knew what I'd be working with - the cultured sea glass beads from ZnetShows which had arrived the previous week. I love sea glass. My husband teases me when we go to the beach because I spend so much time searching for sea glass along the tide line I forget to look at anything else. And here was 'sea glass', with it's soft matte finish and not a sharp edge anywhere to be found, delivered directly to my door. Lovely! And so much of it. A true embarrassment of riches. Apparently they sent their packets out in 'color families'. 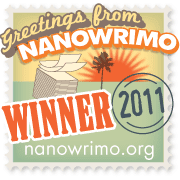 Mine, as you can see, was very, very green. After getting over my initial shock at the color, (I hadn't designed with green in ages) I began to sketch. Then to stitch. The green glass shards reminded me of the new growth from my earlier post, so I decided to give them an enchanted garden to grow through. I think it needs more layers, but am letting it rest for a little first, just in case it really is done. This piece - very much still in process - also works with the green shards. It was inspired by a photograph of a clump of sea grass from one of my favorite books, Archipelageo: Portraits of Life in the World's Most Remote Island Sanctuary. Destined to become a pendant, I turned the design upside down. More fringe to go, then vine work around the ring leading up into the bail. Not sure what I think - I'm reserving judgement for now. Now let's go see what everyone else cooked up this past week by visiting the Studio Sublime. You're right...the shards do look simikar to your "new growth" picture! It was meant to be! Your work is absolutely amazing and I Love their sea glass, too! Wow, that is really striking and beautiful...I always admire beadwork like this...so intricate and thoughtful...really lovely! Yep! You're creating art for sure. Lovely pieces. And how wonderful that Znet picked you! Those are amazing. 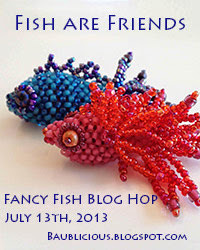 I love freeform beading and you have done such a wonderful job. That last one does look like vines shooting out. Oh, wow, you took beadwork to a new level: I love your creations, and how beautifully you have incorporated that gorgeous sea glass into your creations. Love them! Oh my, how lovely it would be to create with those beautiful shards of glass. You are a lucky girl and looks like you are off to a fantastic start. I like the idea of new growth - stunning beadwork. Love your sea grass inspired pendant. Very cool!! also, wonderful to see the process from inspiration to sketch to necklace in the other piece. a FEAST for the eyes! Green is my favorite- put it on an etched bead and my heart flutters! Gorgeous art! I am especially partial to green so really like what you are working on, especially the pendant. It has such an organic feel to it. I love, love your sea glass stash! So very beautiful. 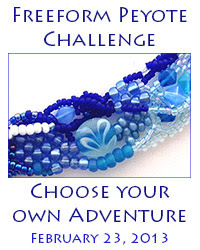 Your necklace with the beaded leaves is stunning - your beadwork is amazing! Wow! I would never have thought of using beads and sea glass in this way! Beautiful colors and wonderful pieces - even if they don't go much farther! I have been an admirer of your work for a little while now, so when I saw what you received from Znet I knew you were going to hit it out of the park and you did. The colors you chose to go with the lime green of the glass shards compliment well. I really like the free form leaves and neck rope. 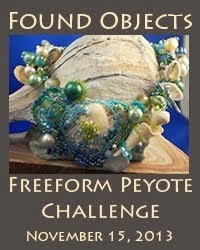 I still have not wrapped my brain around free form peyote and RAW, but I know it will all click one day. I love the start of your pendant I can not wait to see the finished piece. Wow! I love sea glass, there is something so subtly beautiful about it. Your project looks so interesting. I'm sure the finished pendant will be gorgeous. Beautifully unique beadwork. I love the new growth design so far and will look forward to seeing where it takes you. 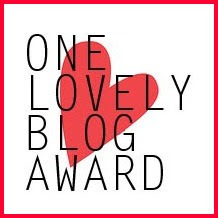 I just love coming to your blog and viewing your 'art' - it always amazes the daylights out of me!! These pieces are no exception - they are completely amazing! I too love sea glass and would be right there with you, head down, looking for little treasures along the beach,...that is heaven. Congrats on the ZnetShows - that's awesome and the stash they sent you is certianly yummy! Enchanted is a perfect discription! Your pieces are amazing and I love the beautiuful colors! That second piece really caught my eye. Like you, I love hunting for shells and such on our trips to the shore, which are not as frequent as I would like. Very beautiful and intricate pieces. I have my favorite colors I work with in fabric and get a little stumped when I have to use something different. I love green. I am not that fond of the emerald shade that is the pantone color this year. This is a great subtle shade. I like the necklace, but I love what you have done on the second piece. I love the touches of red and gold. I am also quite fond of the density of the piece. Green is my favorite color. Love the look of the sea glass. Wow - both pieces are awesome! 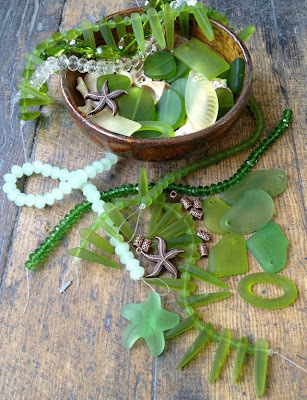 Love how you incorporated the sea glass into the pieces! Wasn't the sea glass fun to work with? I would have gladly traded colors with you though. I got orange and yellow, my two least favorite colors. I like green. Great job on your pieces. Karen, gorgeous work! I'm a fan of sea glass, too, so that first piece really speaks to me. I sometimes let pieces sit until I decide whether they're finished. Generally, when my eyes stop focusing on a specific part of a piece and start taking in the piece as a whole, I know I'm finished - but it's not always so clear! You have been incredibly creative and productive this week! Both pieces are wonderful interpretations of the photos. I love the green shards resembling the new growth green shoots and that pendant is just beautiful with the pop of burgundy! I am just loving all these seaglass pieces! Your's are gorgeous - as always!! Really like what you're doing with the seagrass inspired piece - can't wait to see it finished! Amazing beadwork, Karen!! 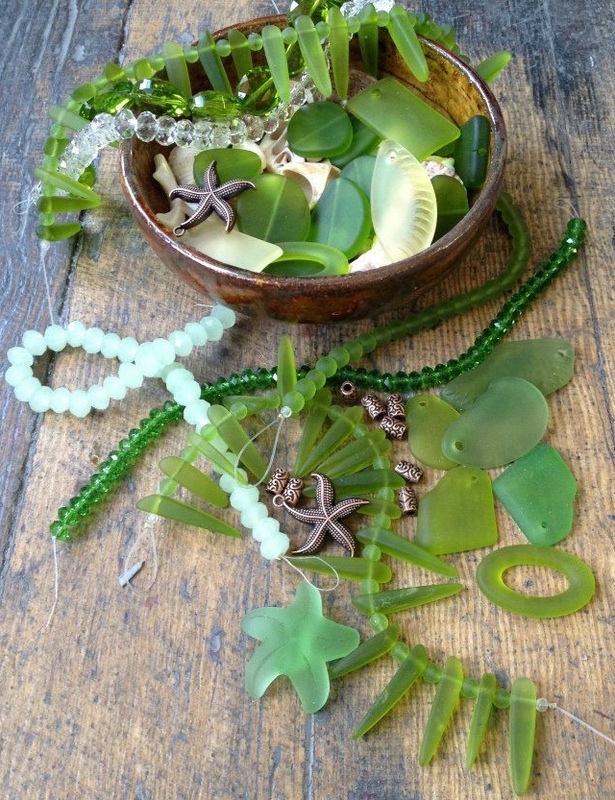 I LOVE the beautiful green sea glass shards you used in both designs, they are true works of art! The last piece that you are making I thought that it was a bangle style bracelet at first, which would be really cool, but the pendant is going to be GORGEOUS!!! Love your "New Growth" necklace!